Holiday Units, Flats and Townhouses, holiday rentals, entire flat rentals and Australian vacation rentals in the Northern Rivers, NSW Northern Rivers and southern Gold Coast, including Byron Bay and Tweed Coast. Townhouses and holiday lettings, duplex apartments and self contained accommodation in Ballina, Kingscliff, Pottsville, Hastings Point, Murwillumbah and surrounding areas. Byron Bay, Kingscliff, Tweed Coast Holiday units, flats, townhouses and duplex units for overnight, weekly and extended holiday lettings. Self contained holiday units, townhouses, duplex apartments and semi detached flats, single story or low-rise walk-up only, in the Ballina, Byron Bay, Tweed Heads area of NSW far north coast, and the southern Gold Coast, QLD. Some properties will have minimum stay holiday rental period and will suit weekly holiday rentals, short term lettings and longer vacation rentals, or temporary corporate and project relocations. Common grounds and facilities maybe shared with permanent residents and other guests. Overlooking the water, Leisure-Lee offers air-conditioned apartments, some have a private balcony with water views. Features include outdoor courtyard with barbecue facilities and water views. All apartments have a microwave and tea and coffee making facilities, and most have a kitchenette or kitchen. Undercover parking available. Situated in a small complex in Byron Bay, 300m to the beach, facilities include swimming pool and barbecue set in a tropical landscape. The self-contained apartments have a kitchen, laundry facilities, and a living area with reverse-cycle air-conditioning. Free WiFi and satellite TV channels available. 2 bedroom luxury townhouse just 100 metres to the beach. Pet friendly. 4-7 night minimum but check for our "fill the gap" availability. Free WiFi. 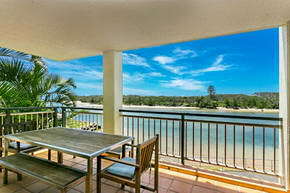 Offering self-contained beachfront apartments, Sandbox is located opposite Tugun Beach. All apartments offer a kitchenette. The air-conditioned apartments offer a dining setting and full laundry facilities. Each unit has a lounge area with a flat-screen TV, a DVD player and a sofa.